Soldiers' Angels - Surprise Visit from Angels! What a wonderful surprise we had from two of our Angel volunteers! Rebecca and Annie are sisters-- one lives in the Dallas area and the other lives in Boise, Idaho. They coordinated long distance to make some beautiful and unique handmade baby items for Soldiers' Angels Operation Top Knot. Recently, they were on a road trip together and decided to stop into the Soldiers' Angels headquarters in San Antonio and personally drop off some of the amazing items they created! 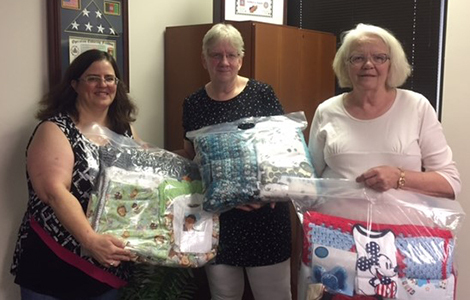 The sets they brought included beautiful knit baby blankets, handmade diaper bags, bibs, and other useful items for babies and moms supported through the OTK program. Thank you Rebecca and Annie!